Deccan chronicles: Vaikuntam’s ‘Untitled’ is priced at about Rs15 lakh. For an increasing number of artists, the place they come from is turning out to be an important part of their journey as art makers. Their POB defines not only their cultural influences, but also the contacts they make in the art world to promote their talent. A common geography, hometowns and friend circles all come into sharp focus at Gallerie Nvya’s latest show, Dakshinayan, which features 30 artists and sculptors from Andhra Pradesh. The show will feature well-known names such as the Surya Prakash and his Impressionist deliberations, K. Laxma Goud, and Thota Vaikuntam, and upcoming artists such as Chippa Sudhakar, who explores the meaning of reality, and Sajid-bin-Amar. “There is so much talent and it is wonderful to be able to help these artists on their journey to reach out of their provinces," says Tripat Kalra, owner of the Gallerie Nvya. Kalra got the idea for this show when she went to attend the wedding of Vaikuntam’s son and was first-hand witness to the talent present in the state. But Kalra is not unique in focusing her efforts on the talents of a group that’s from one particular area. In September, Subodh Gupta, the golden boy of the contemporary art scene, who’s from Bihar, curated Regional Race at Bodhi Art gallery, which showcased seven artists from his home state. “Home is home, helping a fellow artist is like knowing someone from your family has talent and trying to help them," says Gupta. Another curator who has consistently promoted artists from her region is Sharan Apparao, owner of the Apparao Galleries in Chennai. “Artists from the margins are undervalued and undiscovered," says Apparao. 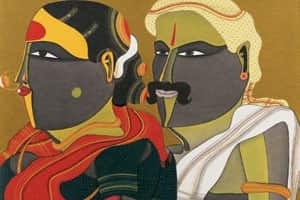 The South, presented by Apparao Galleries, is now showing at the Triveni Kala Sangam, New Delhi, and displays the multifarious art emerging from the southern region. Artists Bose Krishnamachari and Jogen Chowdhury were the first to set an example of promoting artists from their own regions, and now even Jagannath Panda has plans for a show of Oriya artists. “It is about making a statement for the need to show young and upcoming artists and motivate them. It’s not so much about region as it is about this need," says Krishnamachari. One factor that works to an artist’s advantage is the cultural influence of a region. It plays a part in moulding their sensibilities and becomes the starting point of their inspiration. “The reason region-based art shows become easier is because the inspiration derived from the cultural values of one region may be comparative to the other regions. It also helps identify the places from where art is emerging," says Prakash. The southern artists, for example, tend to lean towards figurative paintings with strong vivid colours, strong lines and reflect class consciousness. Day-to-day interaction among artists in the same region is another reason why artists tend to promote their own. “Artists may support someone more because they are from the same friends circle and have seen and understood the talent of the younger artist," says Kalra. This sort of networking is prominent in India as more artists support their counterparts and encourage them to partake in the growing art scene. Often, it all comes down to the college they went to, be it Santiniketan, Sir JJ School of Art, Mumbai, or Jawaharlal Nehru Technological University’s College of Fine Arts in Hyderabad. Most of the artists in Gupta’s show in September were from his alma mater, Patna’s College of Arts and Crafts. Though geographical considerations and a little friendly help may provide an initial push, all artists and gallerists maintain that for an artist to become well known, or even really good, it is necessary for them to move away from similarities and explore their own creativity. “You can’t promote anyone, you can only help them. Unless an artist has his own discipline, dedication and talent, you can’t force them into the art world. They have to do that on their own," says Gupta. Dakshinayan is on at Gallerie Nvya, A-29 Friends Colony, New Delhi, between 11am and 7pm from 9-31 December.